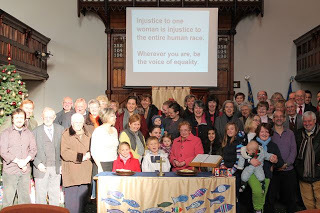 St. David’s Uniting Church is a community of Christians meeting and worshipping in Pontypridd. We are an ecumenical church with denominational links to Baptist, Presbyterian Church of Wales and United Reformed Church. We work ecumenically with other local churches through joint services at certain times of the year and through community projects. We are one church on two sites. The main church building is situated in Gelliwastad Road near the town centre. We also have ‘Church House’, situated in the Whiterock housing estate on Graigwen. Owned by the Presbyterian Church of Wales it is a vibrant hub of mission focussed activity in Graigwen and a vital dimension to St. David’s Uniting Church. What’s our pattern of worship? The morning service (10.45 am) is ‘family’ orientated, including Junior Church, which departs part-way through the service to explore in age appropriate groups. Communion is held on the third Sunday of the month. Junior church returns for this, and children are welcome to receive communion. We have evening worship once a month on the first Sunday of the month. It is a more intimate and informal service following a variety of worship patterns and where communion is also celebrated. On the third Sunday of the month we watch a film together and have a discussion afterwards. Some films we’ve watched are ‘Life of Pi’, ‘Chocolat’, ‘Pride’, ‘The Lady in the Van’, ‘The History Boys’ – and while Rev. Dan Spragg ministered to us for a couple of months in 2018, we watched the New Zealand film ‘Whale Rider’. The other Sunday evenings are free for us to take the opportunity to explore worship at other churches or on-line or to nourish our spiritual life through other activities. We aim to provide worship which is thoughtful, relevant and accessible. Members of the congregation take part in reading the scriptures and leading prayers and our singing group, Cantorion Gelliwastad, contribute regularly to worship. Children and young people – We have a Junior Church that meets during the morning service. Kids club meets at Church house on Tuesday evenings during term time. A successful Holiday club is held during the first week of the summer holidays each year for primary school age children. The week ends with a ‘show and tell’ evening for church members and parents to attend. Ladies Guild – From October to Easter, Ladies Guild meets on Wednesday afternoons and is attracting more to their group, including many non church members. Park Ramblers – Many members and non-members of St. David’s meet on a Monday morning at 10.15am for a walk in the Park followed by coffee or tea in the Cafe Royale. Anybody (you don’t have to attend St. David’s) are welcome to join us. Fair Trade – We are a Fair Trade church and Traidcraft goods are available after the service on the first Sunday of the month. A Peace and Justice group meets regularly to keep abreast of issues including asylum seekers, refugees, climate change, Palestine and Time banking. It fosters links with external partners where relevant, keeps the church informed by providing occasional input to worship, publicity in the news sheet and website, or arranging special events. It encourages individuals to campaign on occasions for example writing cards to political prisoners or organisations that work for peace and justice in all parts of the globe. Cantorion Gelliwastad singing group practices weekly on Saturday mornings and Unedig music group practice as and when required. Who else uses our premises? • Crime Reduction Initiative (CRI) lease the whole of downstairs; they provide support to people with drug and alcohol problems, including methadone services and counselling. • Honeybees – play-school, 5 weekday mornings. • Brownies –weekly in term time.